LOST & FOUND Q&A's with filmmaker Liam O. Mochain and star Norma Sheahan following the 7:10 pm show on Friday, 4/19 and Saturday, 4/20 and after the 1:10 pm show on Sunday, 4/21 at the Monica Film Center. Friday's Q&A will be moderated by Nathaniel Bell, film critic, LA Weekly. The Irish humor and setting make for a lovely time...as we get a droll glimpse of daily life in Ireland, and things that are lost and found again. 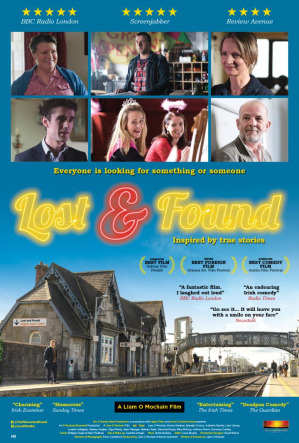 Celebrate the resilient spirit of Ireland with this delightful dramatic comedy of seven interconnecting stories set in and around the lost & found office of a train station in a small Irish town, where everyone knows everyone else’s business. Daniel (writer-director Liam O Mochain) has a new job in the lost & found office, and is trying to get through his first day without losing it. Eddie spends most days in the train station begging; every day he has a different story, but which one is his own? Gabriel plans to surprise his girlfriend by proposing up in the air while flying off to paradise, but airport security has other plans for him. Moya visits a funeral home and signs the book of condolences, not realizing the consequences of signing it. Sile has set a date for her dream wedding; she doesn’t have a groom yet, but that won’t stop her. All segments are inspired by true stories, and together weave a charming portrait of the characters who come in and out of each other’s lives.